I know this is a few days late but I wanted to still post a copy of the March Family Goals sheet for you. Last month I posted about how we use our monthly family goals sheet and I mentioned that I would post a new one each month so you can create a monthly goals page in your family. I hope this page helps you achieve your goals this month in your family! 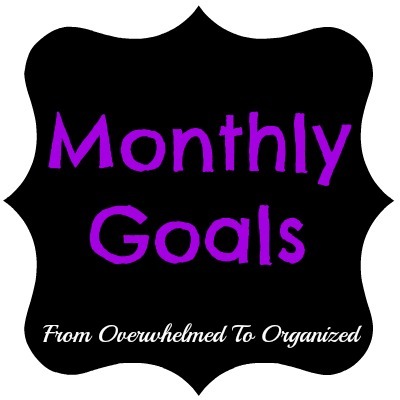 OK, on to the second part of this post... my monthly goals for the blog. If you've been following me for awhile you know that I usually do a monthly review post where I look back at the month and set goals for the coming month. If you're new to the blog and would like to catch up on some of my older posts, you can view the monthly reviews here. These posts are fun for me because I love reflecting on what has happened and looking ahead to what's coming up. But I've noticed that these monthly review posts are not read by as many of you as my other posts. I'm sure there are lots of reasons why, and I'd love some input from you on what you like or don't like about the way I've been doing them. The last few weeks have been filled with snow days, sick days, and computer issues around here, so I've been behind on writing blog posts. On Friday, I turned to those of you who follow me on Facebook and Google+ for advice on whether you'd prefer a monthly review post or an organizing ideas for the weekend post and the response was definitely for organizing posts. That made me think about whether I should continue doing the monthly review posts in general. Or if I should change them up a bit. This month, I'm not going to go back through the various posts from this month. If you missed some, you can find them in the list on the right anyway. I will say, February was a fantastic month on the blog. I passed some exciting milestones and really enjoyed all your comments. It was fun having an ongoing series through the month and I'll be doing that again this month. I also enjoyed being a guest host for the Point of View link party, with this month's theme being organizing. Looking back at the goals I set last month, I achieved some and not others. Our family life changes from month to month depending on how much my hubby is working, or I am working, or both of us are working. It's a bit difficult to get into a blogging routine that way, but I'm always working on improving my ability to juggle family, personal, and blog responsibilities. Organize the office-type spaces in my house and blog about them as part of OrgJunkie's 31 Day Organizational Challenge. Introduce a de-cluttering challenge that you will all be able to join in on. In addition, I will be writing my first guest post in March. I'll let you know when it's posted! So, what are your family, personal, or blog goals for March? And what do you think about monthly review posts? Please leave me a comment with your suggestions about them.